Lock in a great price for Oakwood Resort - rated 8 by recent guests. 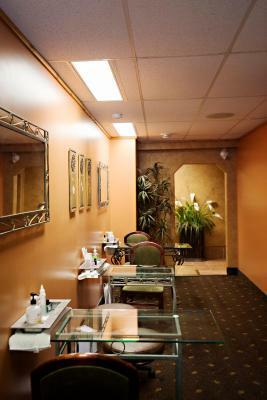 The decor is right on par with the location and the service is very fair and friendly. The rooms were fantastic and the ease of access throughout the resort (pool/bar/gym) was very easy and comfortable. If you like rustic aesthetic and a quality environment this place is made for you. Staff were very friendly....and the room was clean. it was quiet and easy to work as I was there on business. The room was good. Most of the staff was helpful and friendly. We love this place. We come every March break. It's nice and quiet and we can laugh as loud as we please, without complaints. Everything was great. The food at the restaurant was excellent. The continental breakfast came as a surprise, and it was fine. The staff is very friendly. The lodge outdoor feel, good food at Pub. Loved the fireplaces in the rooms kept them warm. The bed was comfortable and when we finally got the room we booked it was ok but not clean. Garbage from former users of the room under the dresser, and remained there. We stayed in the Oak Lodge and the wood walls&cathedral ceiling, gas fireplace, the beds, water pressure in bathroom.... everything was perfect and made for a cozy New Year’s Eve get away. 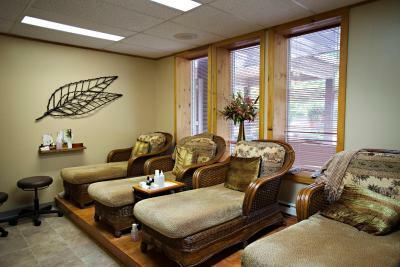 The front staff was most accommodating and we will definitely recommend this location to friends and return. Stayed at this resort many times. Good location. 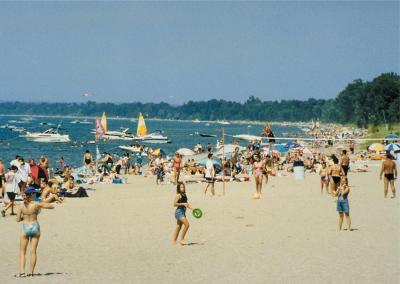 Grand Bend beach is the best in Ontario. Boasting an indoor pool, on-site golf course and a spa and wellness centre, Oakwood Resort is located in Grand Bend, by Lake Huron. Elegantly decorated accommodation features free Wi-Fi and a mini fridge. Each of the guest rooms enjoy a flat-screen cable TV and a bathroom with shower. The suites have a seating area. Some have a spa bath, while most have a fireplace. At Oakwood Resort you will find an à la carte restaurant, private beach area, a sauna and tennis court. Other facilities offered at the property include meeting facilities and a games room. Parking is provided on site at no additional cost. It is 2.5 miles from the local theatre, Huron Country Play House and Grand Bend Motorplex, a motor sports facility. The Pinery Provincial Park is 6.2 miles away. 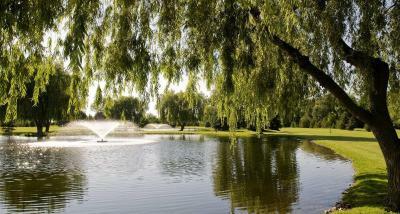 This property also has one of the best-rated locations in Grand Bend! Guests are happier about it compared to other properties in the area. Oakwood Resort has been welcoming Booking.com guests since 12 May 2014. 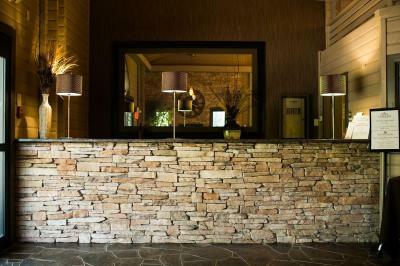 When would you like to stay at Oakwood Resort? Fitted with cedar or pine-panelled walls, this elegantly decorated room opens out on to a patio or balcony. It includes a flat-screen cable TV, fireplace and mini fridge. Wi-Fi is free. House rules Oakwood Resort takes special requests - add in the next step! Oakwood Resort accepts these cards and reserves the right to temporarily hold an amount prior to arrival. Please note that guests must be at least 19 years of age or with a guardian in order to check in. Breakfast is all starches which I do not feel accommodates various dietary needs. I was extremely disappointed that the fitness facilities do not open until 8:00 am as I travel a lot for work and typically they are open by 6:00 am. This was the first time ever a fitness facility was not open early morning. As I am from out of town, running outside is not ideal as I am not familiar with the area. The fellow taking care of the pool Friday evening was a little rude. The noise of working around the property Saturday was very annoying. No soundproofing from hallway noise. Convenient place to stay during the return of the swans. Short walk to beach. 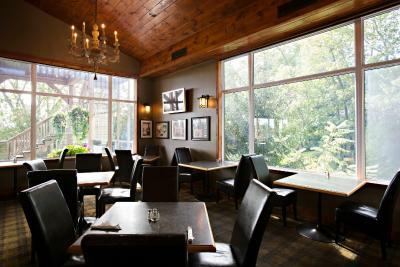 Consistently good food & service at the pub & grill. They breakfast buffet included a variety of options and was tasty. The grounds are beautiful and peaceful. The resort has access to the beach only a couple of minutes walk away. Cost of the room included use of the pool, a small hot tub and the sauna although the sauna was out of order during our stay. We went during the March break week and there was a welcome bag, scavenger hunt and evening movies put on for the kids. The lighting was very dim all over the resort. The facilities were nice, enjoyed the spa. Beds were comfortable and rooms were clean. The price. We've been coming here for 4 years, but we're considering somewhere else because it's so expensive. Check in is too late. For the price, we should be able to have the room for longer than 20 hrs. We were very happy with everything. Didn't like the cold weather, but that is beyond their control. That's all. I booked 2 different rooms. 1 room i booked it in advance and the other later on. On the call i was told that both the rooms are located in separate buildings. While i booked the first room i was shown the room with pine lodge, a room better than standard room. When we arrived at 4 ( on our checking time) they told us that both the rooms are in long house located side by side (i was told something else over the phone). When i asked at the reception the lady told me that we allocate rooms on the basis on first come first serve(i wasn’t told that before). So i had to stay in the standard room despite the fact that i booked it in advance and i was told by the receptionist over the phone that we have two separate rooms in two different buildings. Old and run down. Heat in rooms was poor. The front doors on Oak Lodge need to be adjusted and winterized. We were there on an overnight stay in mid winter at what is primarily a summer resort, so did not get to use or explore the faculties and property. But the overnight accommodations and service exceeded our expectations. No laundry available, not vending machines that I saw and the restaurant was a little limited in choices. I assume we were there off season? Great room could have used a TV for the boys to spend more time in there and it was COLD! I LOVED the bed! The great room was a cool thing to have in the same building. Hockey tournament was the reason for our visit so we had multiple families attending so this room was a great place to gather. They boys did like the frozen lake was close and thought it was cool as well as the lighthouse. The food at the pub was pricey and unappetizing. Chicken pot pie had pastry on top but NO gravy - was so dry!! The shepherd's pie had no taste, the chili was so spicy we couldn't eat it and the cheeseburger was a frozen patty! Only had sweet tea and our kids didn't even like the chicken nuggets!! Our dining experience was extremely disappointing. The "resort" is like a lodge so you have to walk from building to building in the freezing cold. Several small parking lots but we had to walk every time - not very convenient. I'm sure it's better in the summer. The only staff we saw was at check-in/check-out and in the over-priced pub. No maid service? ?